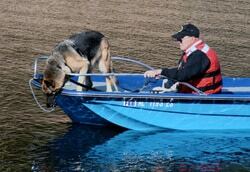 We meet for group training every weekend, mostly on Saturday and occasionally on Sunday for land and water human remains detection, trailing, and area search or air scene training. Individuals that live fairly close to each other will generally get together during the week for additional training. 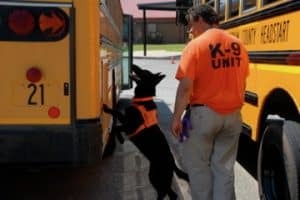 We also work on some of our other skills either before or after training, such as map and compass, scene theory, lost person behavior, Alzheimer behavior, etc. Our goal is to “save lives and prevent suffering”. In order to do this, we need people that we can count on to do the training that is required, as well as to become true “team players”. Although this is a volunteer activity, it requires a huge commitment from all of its members. Please do not join for the sake of your dog or to join a social club. Although we usually have fun during training, we also take it very seriously. We want an atmosphere of professionalism and camaraderie. As per our by-laws, we ask that you attend three regular training sessions before you apply to become a member. Take this time to decide if this is something you truly wish to commit your time, energy and money to. This is not a cheap activity. 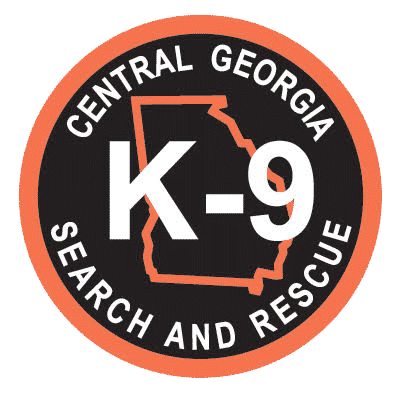 You need to provide not only for the care of your dog, but also for most of your equipment, mileage, loss of time from work (for call outs) and any extra training seminars outside of Central GA. K9 SAR training schedule. Know that training isn’t just during scheduled CGAK9SAR training. You will need to train at least two other days per week if you wish to advance. Training is for the life of your dog. It does not end once you are operational. It is just beginning. If you add more specialties to your dogs repertoire, you are doubling your training time with each one. You will need to continue to improve your own skills as well. You must be willing to train or search at all hours, day or night and in all weather conditions. You must be physically able to handle searches. We will often search long hours in all weather and in any terrain assigned. Outside of our weekly training schedule we do not have any other seminars or training planned at this time.